In addition to food distribution and nutrition education, Manna’s mission includes advocacy for legislation and programs that can provide additional support and sustainable change in our clients’ lives. Last year we brought Maria Chavez on board, seasoned community outreach worker, to provide Manna clients with application support for the Supplemental Nutrition Assistance Program (SNAP/food stamps). Maria made a huge impact in the community through her work, enrolling over 800 new SNAP recipients and securing $119,000 in monthly benefits. 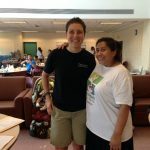 This work is being continued by Fresia Haber, expanding resources for eligible families in need. Manna has also been advocating on behalf of our constituents at the state and local level. 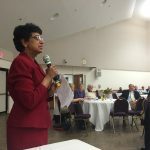 Jackie recently provided testimony in support of Montgomery County Council Bill 16-19 and Manna has been named a key stakeholder in the design of the legislated County-wide Food Security Plan. 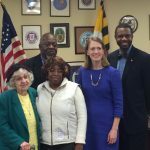 Manna also helped facilitate the testimony of our senior client, Margaret, before Maryland General Assembly committees. This effort resulted in an increase in the minimum SNAP benefit for seniors across the state.